Use your Smartphone to bring out your pet’s best! Reinforce the behaviors you want from your dog — and discourage the ones you don’t. With the Garmin Canine Mobile app installed, sSimply press a key on your phone’s display, and your dog will receive a vibration, tone alert or corrective stimulation from the electronic collar. The signal gets your dog’s attention and allows you to safely and effectively provide a deterrent to unwanted or annoying behaviors. Making sure your pet stays active is so important when it comes to maintaining overall canine fitness and well-being. Using the activity tracking features of your Garmin Canine app, it’s easy to track when your pet is active, for how long and at what intensity level. Use this data to gain insight so you can help your companion enjoy a healthier, more active lifestyle. DeltaSmart features Garmin’s industry-leading bark detection and correction technology with settable levels to help keep your pet (and your neighborhood) quiet. You select the optimum correction level needed to deter nuisance barking. The technology is designed to detect bark signals through vibrations from the dog’s throat, virtually eliminating false corrections caused by other nearby dogs or sound sources. As an added “shield of safety” when you’re not around to personally interact with your dog, one Keep Away Tag is included that allows you to create a geofenced (1-to-3-foot range) alert zone to help keep your pet away from trash cans, flower beds or other “no-go” areas. Additional Keep Away Tags can be added (sold separately). Compact, lightweight and comfortable for your pet to wear, the rugged Delta Smart collar device comes with 3 removable fastening clips (gray, blue and fuchsia) that you can mix and match to create your own customized canine ensemble. The DeltaSmart will attach to collar straps up to 1-inch wide³ (not included), and it’s designed to withstand all the bumps, shakes and scrapes an active dog is likely to give it. 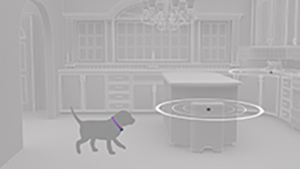 Optimized to work with most dog breeds and coat lengths, the device is water-rated to 10 meters (1 ATM). Plus, it comes with a long-lasting lithium-ion battery that provides up to 3 weeks of use between recharges4.